Become a member during checkout + get 10% off your order. Come on baby light my fire! A single red rose stem says it all. I like you. I love you. I fancy you. I cherish you. I want you. 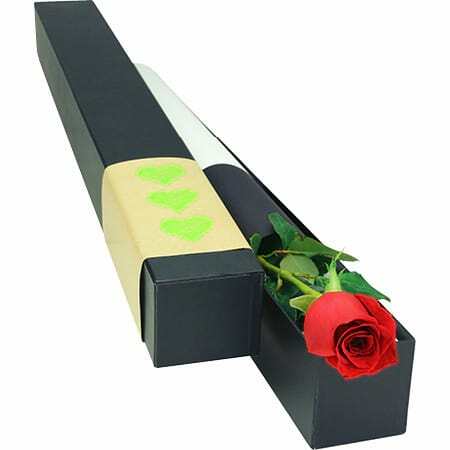 Deliver a single, premium red rose stem in our exclusive presentation box and celebrate your love (or crush) this Valentine`s Day in Sydney. Please Note: Due to volume and logistics on this Thursday 14th February we are unable to guarantee specific delivery times. All Valentine`s Day flower deliveries will be made anytime between 7 - 5.00pm for business addresses and 7 to 7pm for home addresses. No re-directs will be possible if the recipient has left the delivery address for the day, however we will try, where at all possible, to accommodate your needs if this situation does arise. No changes to orders can be made after 18:00 AEST Thursday 7th February for Thursday 14th deliveries. We thank you in advance for your understanding! 2019-02-21 Service rating : I bought the flower literally the night before February 14. She received the flower pn the promised date. Quality service and product! Will order again if I ever plan to. Didn’t expect it to be this good.